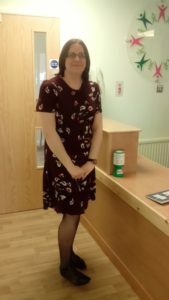 I’m Tracey, the Volunteer Services Manager at the Florence Nightingale Hospice Charity, a job which I’ve now done for 3 years and which I love. There are about 100 volunteers altogether, delivering services such as bereavement, driving, companionship, therapies, making a cup of tea or acting as a general helping hand. We’re always very busy, and if I could sum it all up it would be “None of this would be possible without our fantastic volunteers – thank you”.